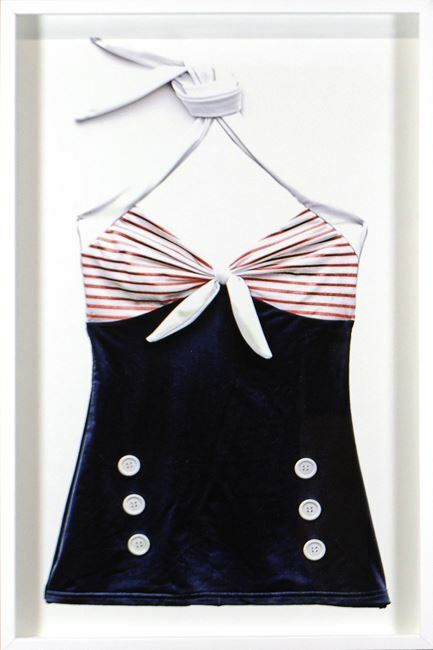 One of four fabulous vintage bathing suits in fresh red, white and blue.These bathing suits are a throw back to the earliest bathing suits that didn't look like an old sweater. Celadon had old patterns made up in period fabrics to create this fun, shadow boxed group. Sun cream not included. These bathing suits are a throw back to the earliest bathing suits that didn't look like an old sweater. Celadon had old patterns made up in period fabrics to create this fun, shadow boxed group. Sun cream not included.